Calvary Baptist Church was founded during the Civil War by pro-Union members of E Street Baptist Church after disagreements concerning the secession of the southern states. 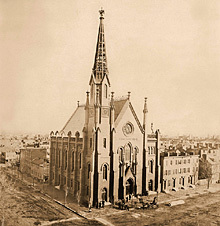 The Calvary church was one of Adolf Cluss's earliest buildings in Washington. The building committee was headed by Amos Kendall, formerly a member of President Andrew Jackson's cabinet, and included his son-in-law, William Stickney. Kendall purchased the land and paid for the building. The architect chosen for its design and construction was Adolf Cluss, then just establishing his architectural practice. It was a large church for its day, 75 feet by 90 feet deep with a tower of 140 feet high. Emphasizing the vertical massing, the delicate spire, roof cresting and pinnacles carried the eye upward on the exterior. The building rose to a considerable height as a result of its internal arrangement. On the ground level was a large lecture room located directly under the sanctuary and two smaller classrooms. Above this level sat the main auditorium seating 800 persons. The entire building is now, and probably was originally, of pressed brick with cast iron window frames and brownstone detail. Cluss used a similar two-story plan also for his earlier built Foundry Methodist, and for St. Stephen's churches, as well as for St. Paul's Chapel. For this prominent building, Cluss chose an asymmetrical massing weighed toward the corner with an aspiring tower. The tower, both engaged within the footprint of the church and articulated as a blocky element freestanding on three sides, rose to a spire of pierced ironwork. The open work iron spire was a feature that recalled in updated materials the famous open work spire of Freiburg Cathedral. Freiburg im Breisgau was one of a number of cities that Cluss seems to have known. In a statement attached to the court case involving the failure of the Freedman's Bank of 1874, Cluss showed his familiarity with Strasbourg, nearest city to Freiburg on its south, with his vivid description of the Cathedral. Calvary's famous tower felled victim to a major storm in 1913. 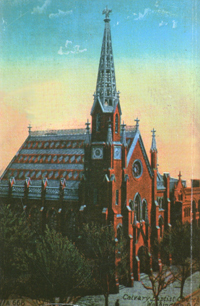 In 1947, the belfry was removed after lighting damage. 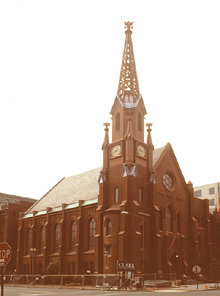 To the neighborhood's great joy, steeple and belfry were reconstructed in 2005.